Interstate 895 southbound at the Westchester and MTA #6 Subway line bridges. Photo taken 07/15/17. I-895 follows the Sheridan Expressway north from Interstate 278 (Bruckner Expressway) to Interstate 95 (Cross Bronx Expressway) for a little more than a mile in Bronx, New York. The wye interchange at the south end includes a left entrance ramp from the southbound Sheridan to the westbound Bruckner Expressways. This configuration remains from when I-278 took the Sheridan Expressway south from the Cross Bronx Expressway. The Sheridan Expressway branches north from the Bruckner Expressway along an elevated viaduct to Westchester Avenue. I-895 lowers to grade level from there, parallel to the Bronx River to I-95. A partial interchange connects the north end of I-895 with I-95 south and East 177th Street by Tremont Avenue. 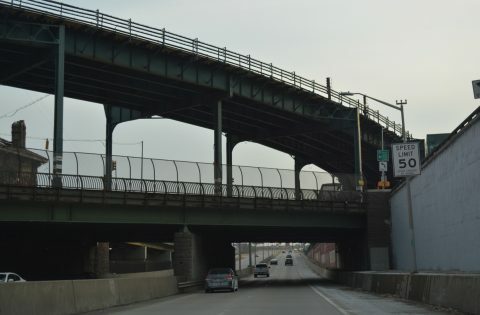 The Sheridan Expressway between the Bruckner Expressway and I-95 (Cross Bronx Expressway) was completed in 19631 and designated as Interstate 278. 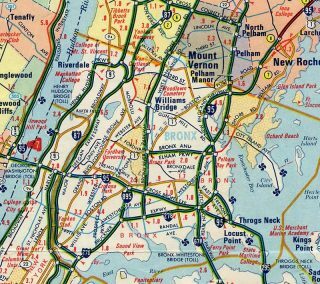 Plans at the time extended the freeway 5.2 miles to the New England Thruway (I-95) in the north Bronx as the northernmost leg of Interstate 278. Community opposition however halted work on the route beyond the Cross Bronx Expressway, ultimately leading to its cancellation. AASHTO deleted I-278 along the unbuilt Sheridan Expressway on June 23, 1969 while renumbering the remaining portion of the freeway as Interstate 895. The meeting also redesignated the Bruckner Expressway east from the Sheridan as I-278 in place of Interstate 878. The MPO passed a resolution in April 2017 to reclassify Interstate 895 as an at-grade Urban Arterial. NYSDOT proposals retain the ramp connections at both I-278 to the south and I-95 to the north, with the arterial remaining on the National Network of Qualifying Highways, permitting truck access. The route will be renumbered as New York 895.1 Construction on the Arthur Sheridan Enhancement Project gets underway in the fall of 2018. Future markers for I-278 and I-878 appear along side Bruckner Boulevard as the Bruckner Expressway had yet to be built in 1961. 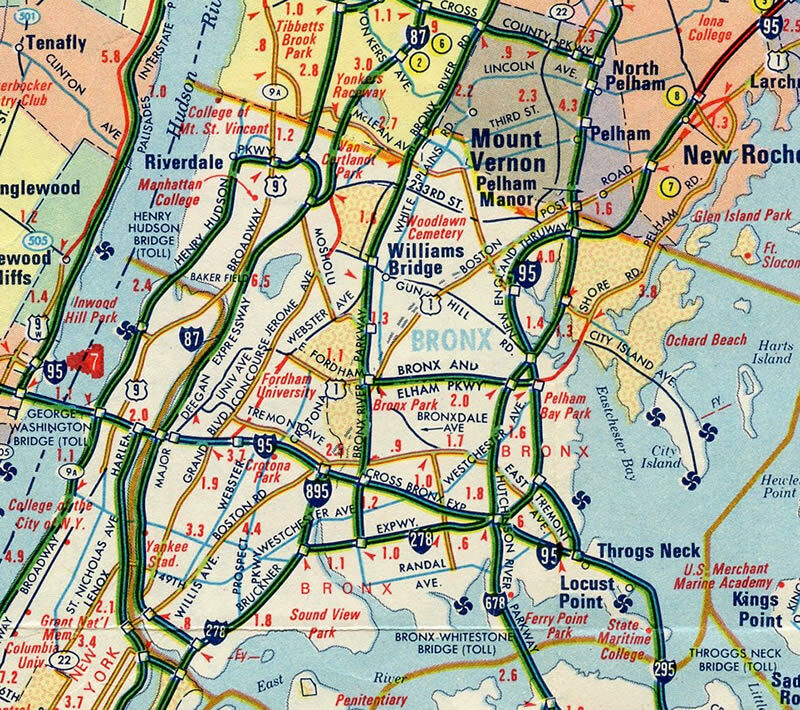 Numbering changes made in 1969 for Interstates 278 and 878 in the Bronx coincided with several others city wide. 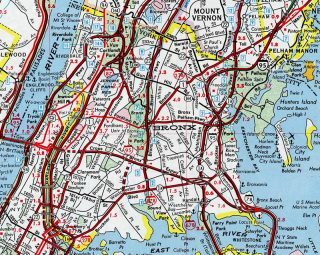 I-495 was removed from the canceled Mid Manhattan Expressway, I-678 was redirected from the Grand Central Parkway west from Flushing onto the rest of the Van Wyck south and I-78 was renumbered as I-295 along the Clearview Expressway and Throgs Neck Bridge. Interstate 895 advances one half mile from the Westchester Avenue and MTA #6 Subway line over crossing to meet Interstate 95 (Cross Bronx Expressway) south. Photo taken 08/29/05. There is no direct connection from I-895 north to Interstate 95 (Cross Bronx Expressway) north. 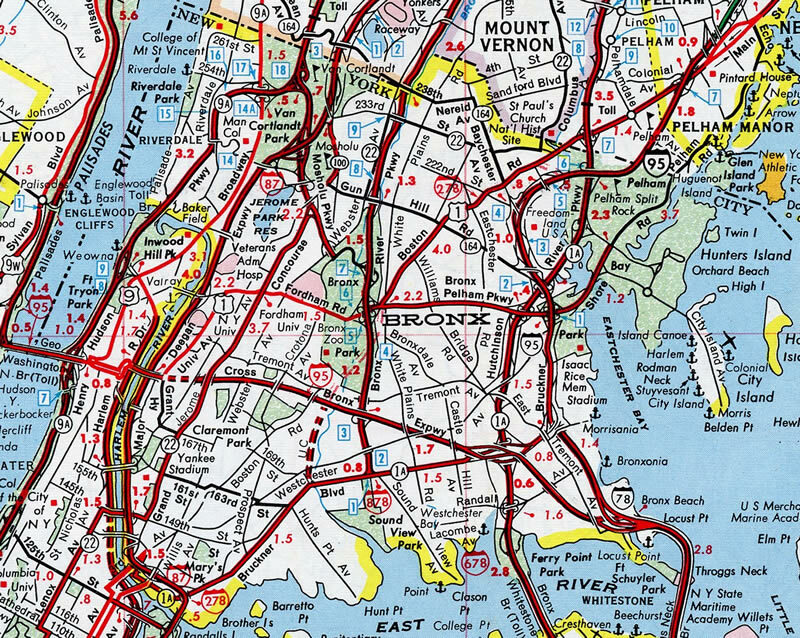 It is assumed that through traffic to the New England Thruway would have used Interstate 278 (Bruckner Expressway) east. An at-grade connection is available otherwise to I-95 north via East 177th Street and ramps at Bronx River Parkway. Photo taken 08/29/05. Approaching the East 174th Street Bridge, Interstate 895 (Sheridan Expressway) north separates into one lane ramps for Interstate 95 (Cross Bronx Expressway) south to the George Washington Bridge and East 177th Street to Tremont Avenue. Photo taken 07/17/17. A loop ramp joins the north end of the Sheridan Expressway with the Cross Bronx Expressway west to New Jersey. Photo taken 07/17/17. The left lane of I-895 curves east across the Bronx River to intersect East 177th Street and Devoe Avenue at the West Farms neighborhood. Photo taken 07/17/17. Devoe Avenue and East 177th Street north connect the Sheridan Expressway end with Tremont Avenue. Photo taken 07/17/17. East 177th Street leads motorists east to Bronx River Avenue and the Cross Bronx Expressway frontage roads by the northbound on-ramp to Interstate 95. Photo taken 08/29/05. Bronx River Parkway travels north from Bruckner Boulevard to Mount Vernon and White Plains. The parkway is only accessible in the northbound direction from the Cross Bronx Expressway service roads beyond East 177th Street. Photo taken 08/29/05. Northbound Interstate 95 (Cross Bronx Expressway) reached Exit 2B for Webster Avenue and the separation with U.S. 1 north. The one-mile guide sign for Interstate 895 (Sheridan Expressway) was removed by 2011 and replaced with a pull through panel referencing New Haven. Photo taken 06/26/05. 0.3 miles ahead of Interstate 895 south on the Cross-Bronx Expressway eastbound. Button copy signs for I-895 used the Interstate 278 control point of Triboro Bridge. Replacement signs reference RFK Bridge and Hunts Point Market. Photo taken 06/26/05. The Bronx River Housing Project rises to the east as Exit 4A for the southbound beginning of Interstate 895 departed from the right. Photo taken 06/26/05. A Breezewood type connection links the I-95 southbound along the Cross Bronx Expressway with I-895 (Sheridan Expressway) via the north side frontage road and East 177th Street. These trailblazers appear at the gore point separating 177th Street from the ramp to Bronx River Avenue south. Photo taken 12/17/17. East 177th Street intersects Bronx Park Avenue at the West Farms community just prior to meeting the freeway on-ramp for I-895 (Sheridan Expressway) south. Photo taken 12/17/17. I-895 begins and crosses a 1951-built bridge4 across the Bronx River from East 177th Street and Devoe Avenue to Interstate 95. Photo taken 12/17/17. Interstate 895 south provides part of the connection between Bronx River Parkway south and I-95 south at one of the three ramps between betewen the Sheridan and Cross Bronx Expressways. Photo taken 12/17/17. 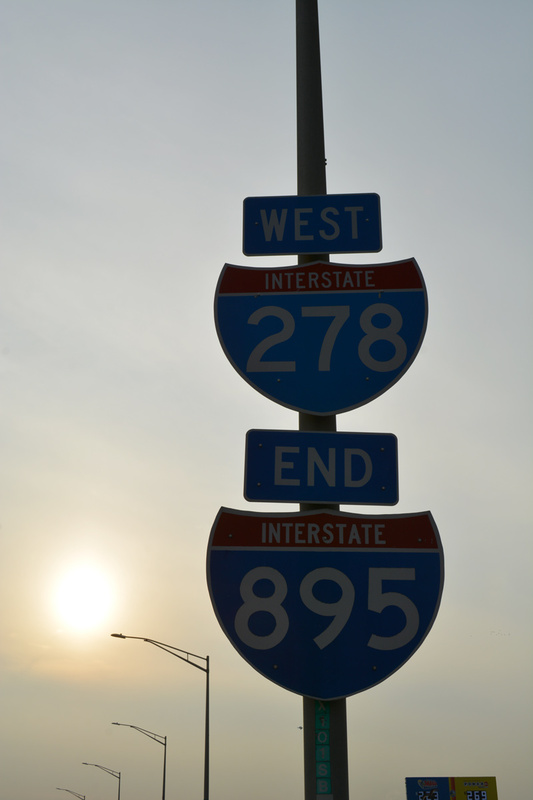 Interstate 895 (Sheridan Expressway) defaults onto I-278 westbound at the southern terminus via a wye interchange. This is the last southbound shield. Photo taken 12/17/17. The Bruckner Expressway (Interstate 278) angles southwest to the southern terminus of Interstate 87 (Major Deegan Expressway) before entering the RFK (Triborough) Bridge system at Randalls Island. Photo taken 12/17/17. Interstate 895 forms a connector between I-278 (Bruckner Expressway) east to I-95 (Cross-Bronx Expressway). Initial control points for the Sheridan Expressway reflect connections with the George Washington Bridge and East Tremont Avenue. Photo taken 07/17/17. Older control points for the upcoming wye interchange (Exit 49) with I-895 north referenced New England for Interstate 278 east to I-95 north and the Throgs Neck Bridge for the connection to Interstate 295 (Cross Bronx Expressway) south. Photo taken 07/17/17. A viaduct leads I-278 (Bruckner Expressway) east toward Exit 49 for I-895 (Sheridan Expressway) north. The Bruckner Expressway merges with Interstate 95 north in 3.3 miles. Photo taken 07/17/17. Interstate 278 takes a sharp curve at the separation with the Sheridan Expressway north. The freeway crosses the Bronx River to the immediate east as I-895 quickly reaches the Westchester Avenue off-ramp to Hunts Point Market and Industrial Park. Photo taken 07/17/17. An on-ramp merges onto I-895 north from Bruckner Boulevard and Hunts Point Avenue below the I-278 viaduct beyond what was the first northbound reassurance marker. This shield went missing by 2005 and was never replaced. Photo taken by Douglas Kerr (09/14/02). Mid 2000s sign replacements changed Exit 46 to Exit 49 and East Tremont Avenue to East 177th Street for I-895 (Sheridan Expressway) north. Photo taken 08/09/04. Subsequent sign changes at the split with I-895 also replaced New England with New Haven for the continuation of I-278 east to I-95 north at the Bruckner Interchange. Photo taken 08/09/04. Meeting Minutes, Special Committee on U.S. Route Numbering. https://route.transportation.org/wp-content/uploads/sites/50/2017/06/USRN-01-Minutes-and-Application-results_-AM-Phoenix-2017.pdf AASHTO, September 24, 2017. “Sheridan Expressway Removal Gets $97 Million Boost in State Budget.” Streetsblog NYC, April 5, 2016. “Governor Cuomo Announces New York City Highlights of the 2016-17 State Budget Agreement.” (New York) Governor’s Press Office, April 1, 2016. Rte I895 over Bronx River, Bronx County, New York. BridgeReports.com. Page updated August 2, 2018.